Announcing WAPA’s all new Asphalt Parking Lot Design Guide for 2018. Also included is a comprehensive 61-point Inspection Checklist to help an on-site inspector identify key processes and follow best practices to produce a quality parking lot. August 2018 Update: This publication now includes a two-page Guide for New Parking Lot Owners. This new appendix explains what to expect from a new parking lot, best practices for optimum performance, and maintenance tips. 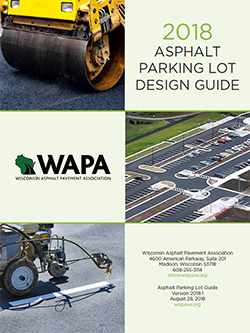 The Asphalt Parking Lot Design Guide is part of WAPA’s commitment to supporting the growth and use of all types of asphalt pavement in Wisconsin. You can read more about the benefits of use of asphalt parking lots in our one-page brochure Asphalt: The Smoothest Way To Welcome Customers. Please feel free to share this information with your colleagues and customers. If you have any questions, or if you wish to receive a printed copy of the 2018 Asphalt Parking Lot Design Guide, please email WAPA at info@wispave.org. Inspec, Inc. is an independent engineering/architecture firm specializing in pavement, athletic track, and tennis court consulting. Our consulting services include failure investigations, design, construction administration, inspection, and management programs. We also specialize in roof, exterior wall, and waterproofing consulting.